Located in Amherst, MA, Camp Shemesh is a summer day camp of the Jewish Community of Amherst (JCA). Camp Shemesh applied for a Gendler Grapevine Project grant to expand their garden (in size and supplies), to hire a garden specialist to develop and run educational garden programs, and to hire a stewardship coordinator to oversee continued integration of garden education and environmental programs across the JCA lifelong learning constituencies (school, teens, camp, young families and tots, adult education). Part of the success of the garden is due to not just Camp Shemesh’s efforts, but also the JCA community in general. 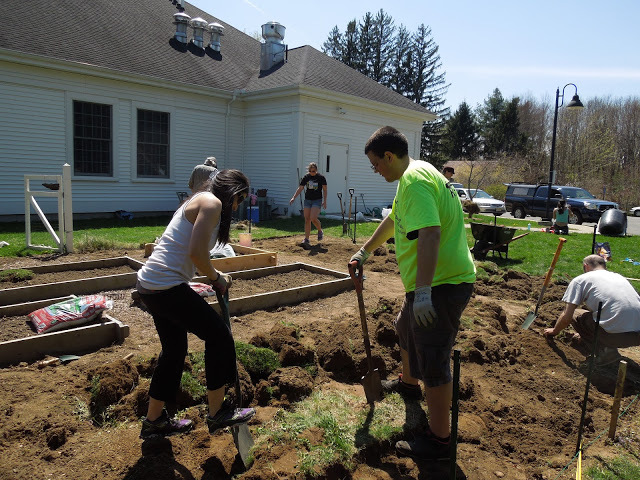 Throughout the spring, college students from the University of Massachusetts and people of all ages from the JCA community helped break ground, expand the garden site, build raised beds, spread compost, plant seeds, transplant herbs, and install a new fence. Organization and planning were key elements to making the garden work with the camp schedule. 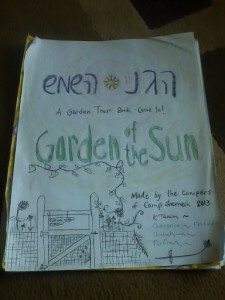 In the spring, Camp Shemesh sent their garden specialist to a Teva Seminar on Jewish Environmental Education, focusing in the Food & Farm Track. The specialist returned from the seminar with substantial curriculum and design plans. By the time the first camp session started, the garden was already producing sugar snap peas, herbs, and edible flowers. Each week, new produce was ready for tasting and picking. Campers helped to harvest over 150 pounds of food from which they made pickles, zucchini creations (part of their Iron Chef Zucchini competition), pesto, challah, herbal teas and more. In all, Camp Shemesh produced at least 200 pounds of food, at least 200 pounds of compost, and had well over 300 people visit the garden between May and September. 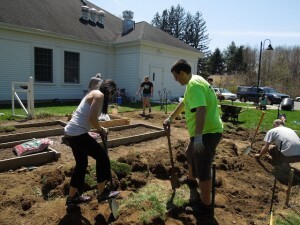 The garden became a new focal point in the community and contributed to a sense of nature connection for campers, staff and families; this is made evident by the demand they now have for garden programs in camp and in other programs at the JCA. They even set out a gan (garden) guestbook, which now includes drawings, weather reports, harvest reports and more from visitors. The stewardship coordinator will work with this budding interest to build diverse, adaptive, and integrated environmental programs and initiatives. The new stewardship coordinator is being trained in permaculture design. There are many reasons they chose to use a permaculture approach; however, two stand out. The permaculture design will enable Camp Shemesh to increase production through perennial plantings and integrative management systems while minimizing the need for intensive human labor. And, in terms of institutional capacity (administrative overhead, grounds and maintenance, future leadership of environmental programs), permaculture design will help them to implement a community-based process, empowering and enabling individuals to step up in the future in order to maintain the success of their environmental initiatives and the culture of stewardship in their community. Part of the stewardship coordinator’s job is to consider the intersection of Jewish values and ecological principles in the permaculture design itself. By considering Jewish values and community goals in the design process, the stewardship coordinator will design for the enhancement and integration of ecological, social, spiritual and programmatic landscapes. Camp Shemesh realized that just because a garden is right next to the front entrance of a building, it does not mean it is actually VISIBLE to the community! To get people to really see the garden, smell the garden, and taste the garden, they had to make considerable efforts to promote the garden to the community. Events proved to be the best way to do this – especially ones at which entire families were present. This way, campers and students could get excited about their experiences in the garden and bring their families back to share the experience. Their most successful type of event was community workdays. People enjoyed working in gardens and were willing to do dirty, sweaty work when they were with a group of people they enjoyed being with! Their educational programs garnered people (Sukkot, teen programs, etc. ), but the volunteer workdays seemed to generate the most excitement and buzz. 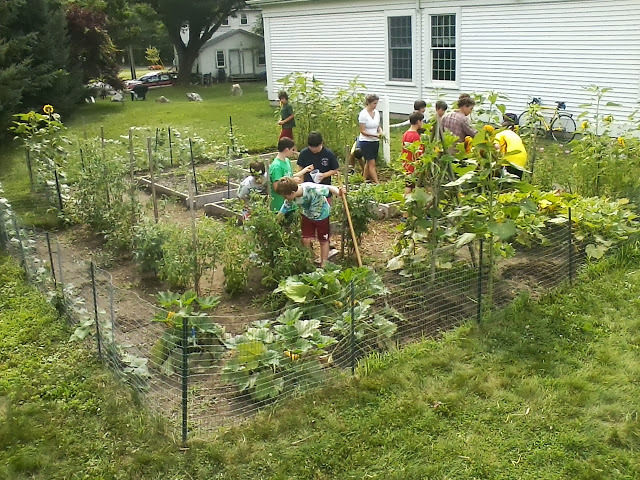 Camp Shemesh thinks this is in part because by working in a garden, people then get to watch the garden grow as a direct result of their labor, and they get to feel like they are contributing their energy to a good cause. They also learned that not only is it essential to have garden work integrated into programming (otherwise there is too much work to get done! ), but it is also equally important to have multiple groups and individuals scheduled for programs so that unexpected weather, for example, does not completely derail a project. Camp Shemesh noticed that the garden might result in restructuring parts of camp. For example, they might schedule their camp sessions differently. Currently, they run six one-week sessions, historically starting at the end of June. They’re considering pushing the camp sessions one week later in summer 2014 so they have more produce to harvest in the earlier sessions. They suggest hiring a full-time staff member for the duration of the summer season whose specialty is garden programming, as opposed to hiring a garden specialist whose only true responsibilities are to plan and run the garden programs. Camp Shemesh explains that this will help the specialist be better able to connect with campers and make campers feel that the garden is part of day-to-day camp life. For other camps looking to implement this project, Camp Shemesh suggests hiring an stewardship coordinator in early spring. Questions of supervision, payroll, administrative overhead, and site logistics all took a lot of time to think through and discuss with the right people. Make sure you plan accordingly. They also suggest that you integrate your garden programming into what else you do at camp so that campers internalize how gardening can be related to the rest of their lives and Jewish communities. For example, at Camp Shemesh, compost became THE link between the garden and the rest of camp. At the end of meals, they made sure to discuss psolet (waste) and compost, so when campers brought their compost to the garden they were able to tangibly understand how the sandwich they didn’t eat ended up as new soil in the garden. They also included garden songs in song sessions and did song sessions in the garden, which linked their usual camp routines and rituals with those of the garden. Lastly, they encourage any camp, synagogue, or other group considering implementation of similar programs to design from the beginning the mechanisms that will support the program over time. Have a timeline in sight and design for that timeline in phases, rather than only designing for your immediate goals.